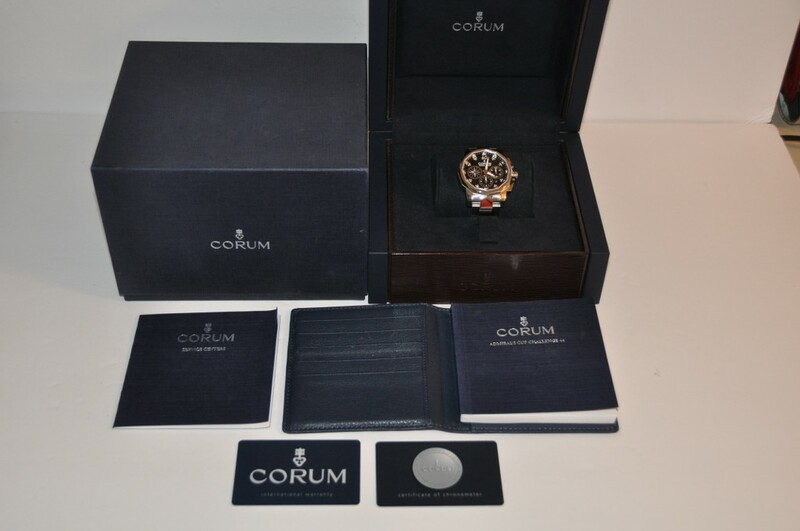 CORUM ADMIRALS CUP 44 CHALLENGE CHRONOGRAPH. REF;753-693-20. SER. #2108641. RUNS AND KEEPS GOOD TIME / OVERALL 98% CONDITION. 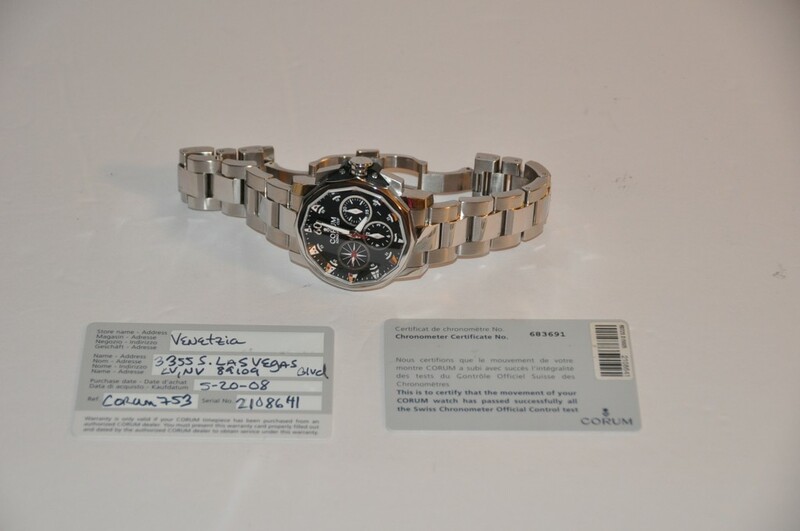 RECENT FULL FACTORY SERVICE AND REPLACED PARTS FROM CORUM AUTHORIZED SERVICE CENTER IN HOLLYWOOD FLORIDA. ONE YEAR SERVICE WARRANTY STARTING 6/25/2018. PURCHASED BRAND NEW FROM AUTHORIZED DEALER / VENETZIA IN LAS VEGAS 5/20/2008. WATCH IS LIKE NEW. 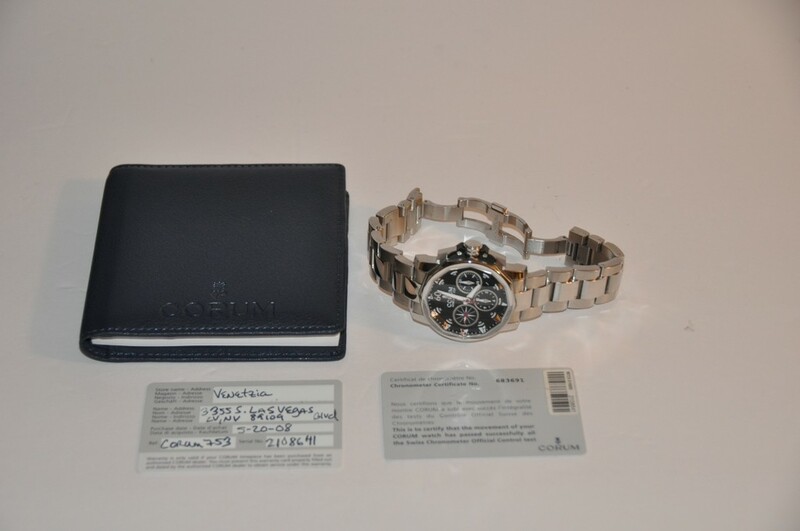 COMPLETE BOX SET, CORUM WALLET AND CORUM CERT CARDS AND BOOKS. NO CORUM PEN IS INCLUDED. SELL FOR $2650 + SHIP/INS. MSRP WHEN NEW $9500. JIM CLEMENS - ROCKLEDGE, FL. CELL OR TEXT - MOBILE; 321.960.1103.